It’s all deceptively accessible from the towns, yet feels a stunning, natural world away. The Sounds remain relatively undiscovered, a retreat from the mainstream although, if you need it, civilisation is unexpectedly close at hand. 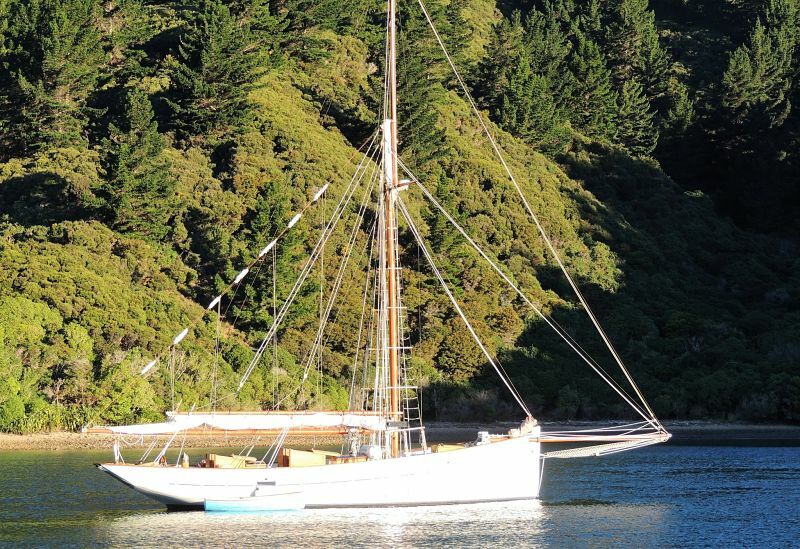 For centuries, the Marlborough Sounds have offered a safe harbour to travellers. First to Maori traders and war parties; then to European explorers, such as Captain James Cook and Dumont D’Urville; and now to visitors seeking new landscapes and rejuvenating experiences. 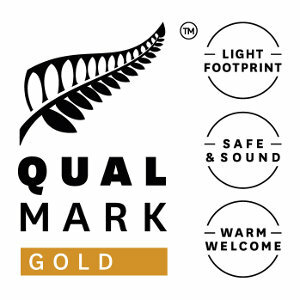 The Marlborough Sounds encompass twenty percent of New Zealand’s total coastline. This intricate maze of waterways is made up of three Sounds, the Queen Charlotte Sound, the Kenepuru Sound and the Pelorus Sound. Within the area is pristine native forest – ranging from towering 800 year old rimu trees, to lush punga tree ferns and beautiful native orchids leading down to picturesque shorelines. 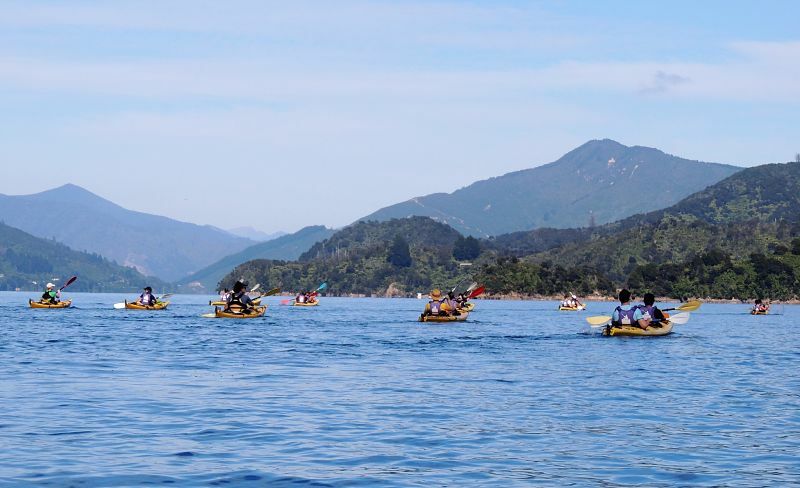 The myriad of bays, coves and inlets are perfect for exploring by sea kayak. The Queen Charlotte Sound is the most well known of the three Sounds, and is dominated by bush-clad shorelines, deep bays and coves. The Kenepuru Sound is the smallest of the three Sounds. 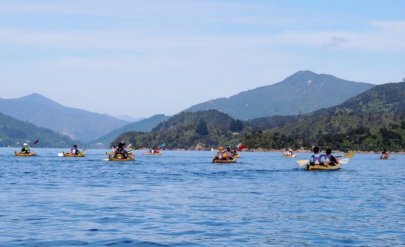 The Pelorus Sound has expansive waterways, with some exposed areas; it is made up of beautiful sea kayaking areas (such as Tennyson Inlet and Nydia Bay), while much of the rest of the Pelorus Sound is predominantly farmland and forestry. Stretching between the Queen Charlotte and Kenepuru Sound is the Queen Charlotte Track which runs almost the entire length of Queen Charlotte Sound. 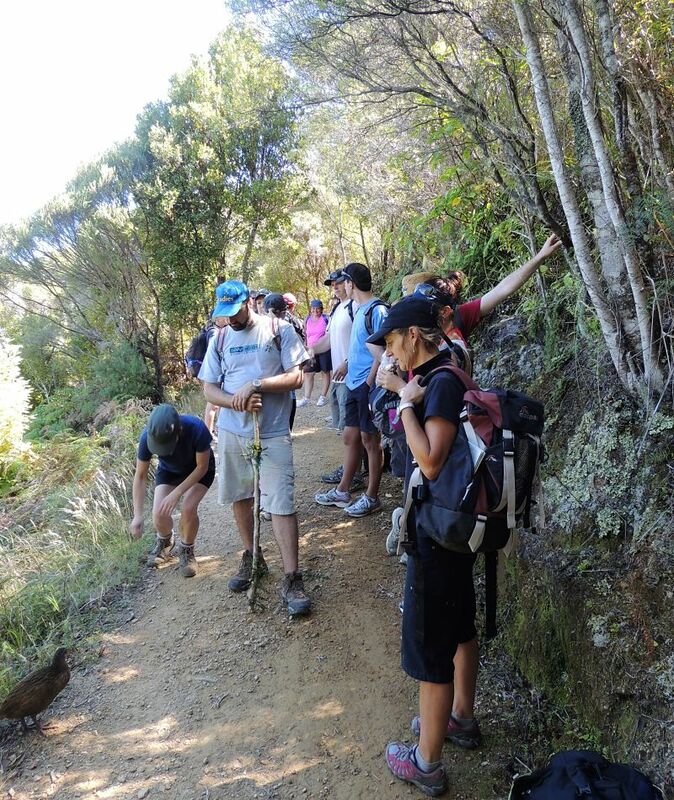 The track stretches from Ship Cove to Anakiwa – 71 kilometres (approximately 45 miles) of spectacular walking track with stunning views and contrasting landscapes, passing through historic sites, secluded bays and lush coastal bush. 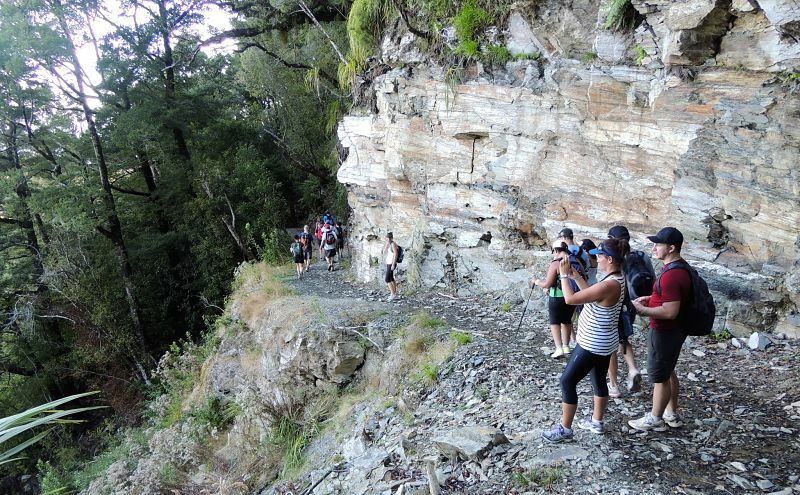 Although the Queen Charlotte Track can be walked from either end, the recommended start is at Ship Cove. Simply Wild Journeys offers a Four day private Journey through Queen Charlotte Sound, sailing, hiking, sea kayaking and mountain biking, with a spectacular helicopter flight over the Marlborough Sounds and a visit to a remote farm on rugged D’Urville Island before flying back to Nelson. Boarding our comfortable yacht around 9.00am in the little seaside town of Picton, you’ll set sail for the 3 – 4 hour trip to outer Queen Charlotte Sound and historic Ship Cove via Blumine, Long and Motuara Islands. 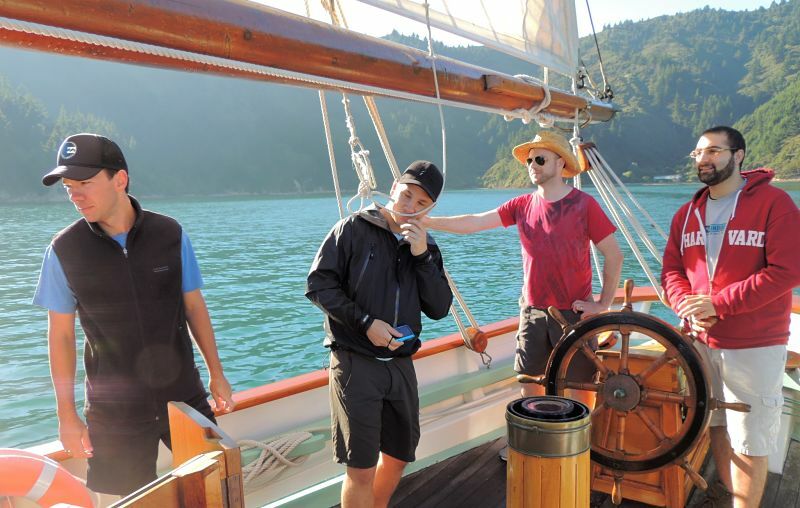 You’ll have the opportunity to take on crew and helming tasks on the yacht if you wish. 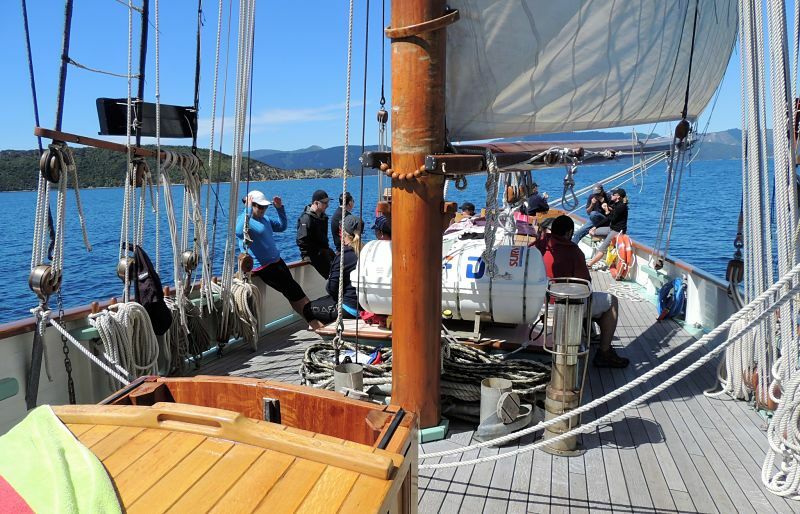 Ship Cove holds key cultural heritage stories told in a beautiful sheltered cove with a lush coastal forest backdrop. Totaranui (Queen Charlotte Sound) was visited by the great Polynesian explorer Kupe, during his exploration of this country, which his wife named Aotearoa. This site is internationally recognised as Captain James Cook’s favourite New Zealand base during his three wide-ranging voyages of exploration. In all, his expeditions spent 170 days at this anchorage between his first visit in January 1770 and final departure during his last voyage in February 1777. Cook found this place provided a central and secure anchorage with good wood, water and fishing where he could prepare and provision his ships and restore his crews. From Ship Cove we begin our Journey in earnest, south along the Queen Charlotte Track for 71 kilometres to Anakiwa; hiking, sea kayaking and mountain biking. 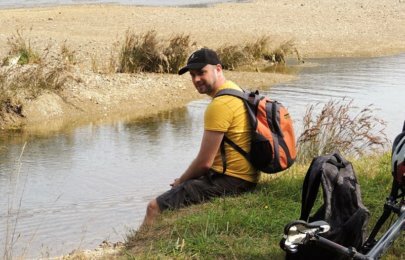 The track is not particularly steep, but it is undulating, with hills ranging from sea level to a maximum of 400 metres. Heading south from Ship Cove you begin the track with a 2 hour walk to Resolution Bay. Climbing away from Ship Cove, the beauty of the walkway is soon revealed. A deep canopy shades the profusion of tree ferns, the occasional nikau palm and other plants. 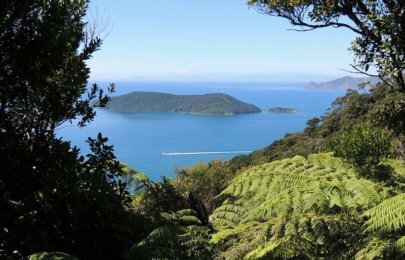 A lookout offers a pleasant respite and good views of Motuara Island and the outer Queen Charlotte Sound and across to the North Island. If visibility is good you will be able to see both Kapiti Island and the North Island of New Zealand in the distance. From here you’ll climb over the Ship Cove/Resolution Bay Saddle and descend into Resolution Bay itself. From Resolution Bay the track follows an old bridle path ascending over a ridge and leads down into Endeavour Inlet. The gently inclining track passes through stands of kamahi and then beech forest as it passes over a saddle. Then it’s a fairly easy walk down past Tawa Bay, before the track then gradually descends through sections of manuka, five finger and mahoe, followed by a magnificent stand of original native bush and crystal clear streams. Slowly glimpses of the nearby sea and foreshore come into view, and soon you’ll join the yacht before sailing to a secure anchorage for the night in quiet bay. Our chef will prepare dinner. We start the day disembarking at Camp Bay, before beginning the most challenging and rewarding 23.6 kilometre section of the track. After climbing away steeply from Camp Bay, sweeping panoramas of the Queen Charlotte and Kenepuru Sounds come into view.panorama of Queen Charlotte and Kenepuru Sounds through the entire 360 degrees. Make sure you’ve got your camera handy! The trek to Torea Saddle/Portage Bay is interspersed with one breath taking vista after another. Eventually the track twists steeply down to the road between Portage Bay and Torea Bay. 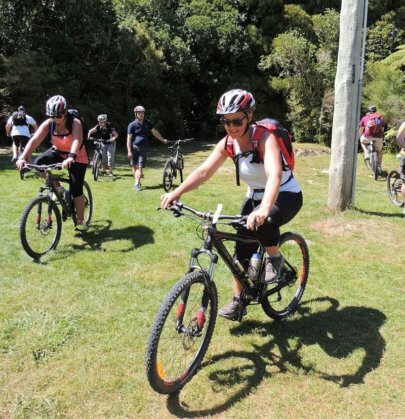 This road, or saddle, is the same as that used by the Maori to haul their wakas (traditional Maori canoe) between the Queen Charlotte and Kenepuru Sounds, saving many hours of paddling. We’ll walk down to Torea wharf to meet the yacht before finding a secluded cove for the night. Our chef serves dinner. 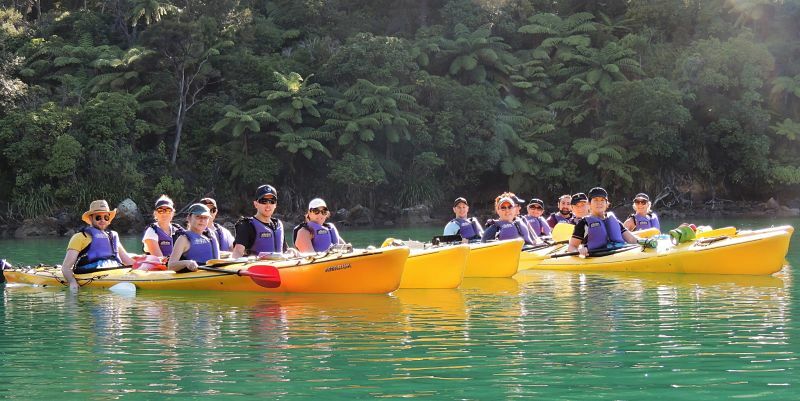 We’ll meet our kayaks and prepare ourselves for the 2 – 3 hour paddle along the Sound to sheltered Mistletoe Bay, stopping to feed the tame snapper at Double Cove. 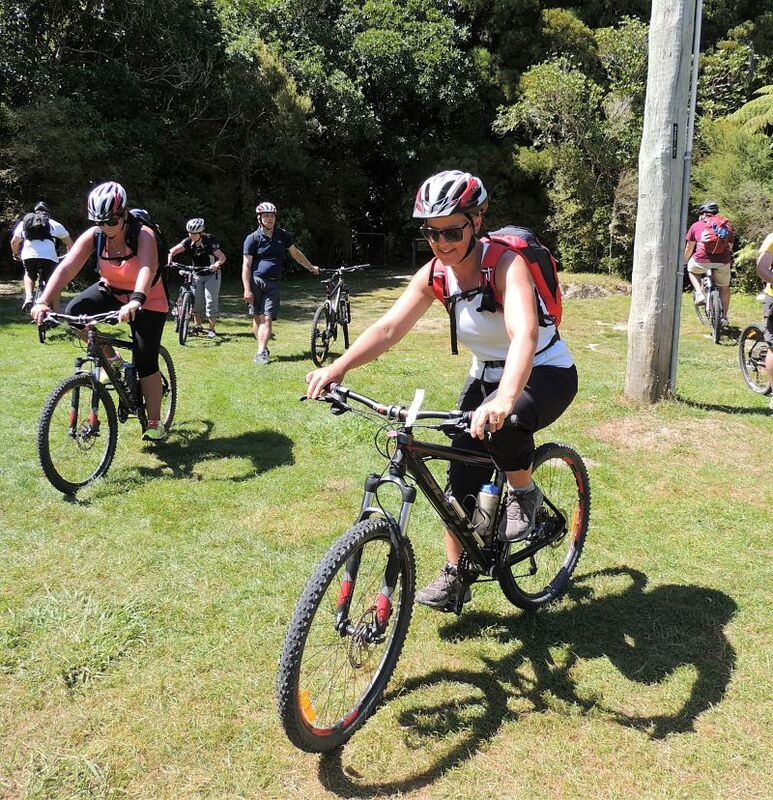 Arriving at Mistletoe Bay, there will be time for a swim off the wharf and lunch, before coming to grips with your mountain bike for the final 2 ½ hour, 12 kilometre section to Anakiwa. This section is graded for novices, but if you haven’t been on a bike for a while, you’ll find it testing until the track widens and becomes easier as we near Anakiwa. Arriving at Anakiwa, which is the base for Outward Bound’s New Zealand operation, we’ll be met our water taxi for the short ride back to luxury accommodation at the Bay of Many Coves Resort for the night. 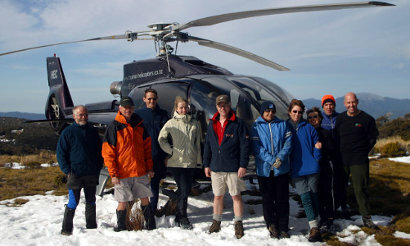 After a late breakfast, we will board our helicopter for the spectacular flight through outer Pelorus Sound, to remote D’Urville Island. D’Urville Island is exposed and extends out into Cook Strait, one of the most challenging sea ways in the world, on the outer edges of the Marlborough Sounds. New Zealand’s fifth largest land mass offers a quiet sanctuary from the modern world. Think of the outer Hebrides or remote Islands of Scotland. 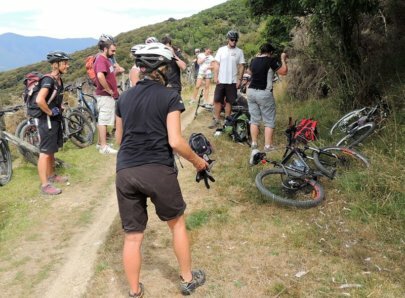 The island landscape encompasses large areas of ancient native forest, with sweeping views across the surrounding ocean and Marlborough Sounds from the island’s mountain peaks. From there it’s a 20 minute flight back along the coast of Tasman Bay to Nelson.